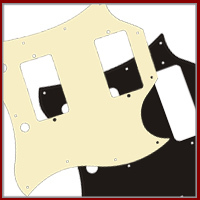 Pickguard for Gibson® SG ®. 3-ply black (B/with B) with 2 humbucking spaces. 1.75 inches between spa..
Black full face pickguard for Gibson® SG®. 3-ply Black (B/ W / B). 2 humbucking routes each measure ..
White full face pickguard for Gibson® SG®. 3-ply White(W/B/W). 2 humbucking routes each measure 2.75..